Kim Schneiderman, “Step Out of Your Story”. 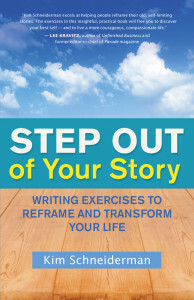 Join Vivian Komori and Ronni DiGiovanni as the chat with Kim Schneiderman, auhor of "Step Out of Your Story". Every life is an unfolding story, a dynamic, unique, purposeful, and potentially heroic story with bright spots, turning points, and abounding opportunities for personal growth and transformation. From the day we’re born, we become the star and spin doctor of our own work in progress, with the power to tell our stories as triumphs, tragedies, or something in between. "A truly fresh approach to reflective writing. By placing our own lives in the context of plotlines, characters, and narrative devices, Schneiderman provides a genius way to twist our culture’s fascination with reality TV and sensational movies and channel it toward the story that matters most: the narrative of our own lives."